Last edited by Sherman Davies; January 2nd, 2013 at 09:21 PM. Last edited by Sherman Davies; June 20th, 2009 at 10:55 PM. Wow, been a while since I posted a new Marvel custom. I got burned out on customizing for a bit, then when I got back into it I was focused on playtesting my DC customs, not to mention I got distracted with Pokemon-scape and Lord of the Rings-scape projects. Anyway, I figured I would dip my toes back in the Marvelscape waters with a custom of one of my favorite characters, Nightcrawler. My version of Nightcrawler shares a lot of similarities with the other versions of him in the A-Z Supers Index; after all, he pretty much only has one power, so it's not like people were giving him Heat Vision or anything. However, I noticed that no one else decided to represent Kurt's common tactic of teleporting enemies with him, disorienting them with the teleportation's side effects. That kinda surprised me, since it seemed to me to be his main attack, much in the same way that Kitty Pryde always phases through robots to short circuit them. Of course, I'm not a huge X-Men reader, so what do I know? Anyway, this version of Nightcrawler can act as a transporter for friendly figures - but with a risk - or as an annoyance figure like Spider-Man. Note that if an adjacent figure attacks Nightcrawler, if Kurt makes his Evasive Teleport roll he can take his attacker with him and make him pay for it. Last edited by Sherman Davies; June 20th, 2009 at 11:11 PM. SD, I like this Nightcrawler a lot and it just may be my card of choice for the character. That's the highest compliment I can give. If I can make one suggestion about wording. In Mutant teleportation, I suggest you say something about moving the other figure if there is an unoccupied space adjacent to the chosen space. Maybe I'm overthinking it but just trying to rule out confusion when there is no empty space to bring somebody with him. EDIT: You know what, if CARRY doesn't specify that, I guess Teleport doesn't need to either. Ignore my post please. Last edited by Matt Helm; June 21st, 2009 at 01:18 PM. Don't worry Matt, I thought the same thing when wording the power but then looked more closely at Carry myself and saw that it was unnecessary to state that a carrier couldn't carry someone if there wasn't a spot to drop them off. I had also originally intended that Nightcrawler only be able to teleport to empty spaces within a clear line of sight, but that brings up all sorts of questions as to whether or not figures can "see" spaces higher than them. Too bad, it would've added some flavor and given him more of a reason to walk every once in a while (around a ruin, for example). Excellent, another elegantly simple and extremely playable custom of one of my favorite characters. Thanks - Nightcrawler's one of my favorite Marvel characters too, because I have a fondess for swashbucklers of all stripes. Here's another character that I doubt official Marvelscape will ever get to making, the longtime partner of Captain America - Falcon! I gave him Flanking Attack at a time when I was being inspired by D&D rules (Oh, who am I kidding? I stole 'em) and thought that it would be nice if Heroscape could have a mechanic that reflected two people ganging up on a third. I initially considered giving him a Redwing (his pet falcon) attack much like Sonlen's Dragon Swoop, but for some reason the lack of a mini Redwing attached to the figure made me go a different direction. His Eyes in the Sky power is supposed to reflect his ability to see through the eyes of any bird on earth, not to mention his modus operandi of soaring above the battlefield and getting the lay of the land. - I think you can reword the first two abilities. 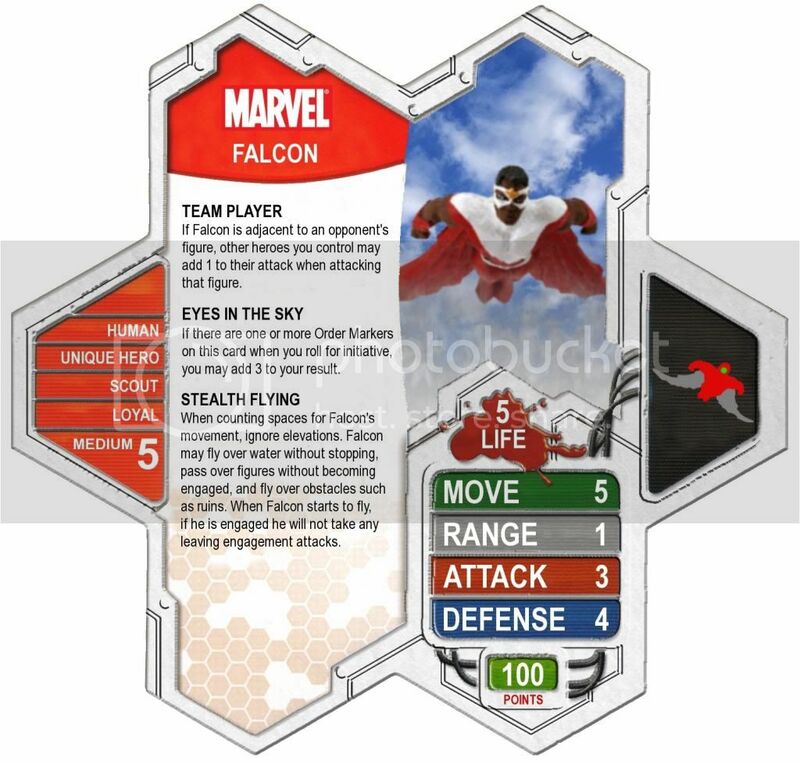 If Falcon attacks an opponent's figure that is adjacent to at least 1 other figure you control, Falcon may roll 2 additional attack dice. If Falson took a turn in the previous round, you may add 2 to your roll for intiative. I just think they are both a bit crisper this way. Thanks for the advice, hi1 - the card's been updated. Here's another one I've been sitting on a while, and since I've posted Nightcrawler I may as well give him an X-Man buddy (and another favorite of mine): Colossus! Colossus was another early custom of mine. I'm planning on updating his Fastball Special wording so that it doesn't say that the space has to be within clear sight of Colossus, since that causes problems. Instead, I'll probably try to find a way to word it so that the thrown figure must be within clear sight of Colossus on the space it lands on. Last edited by Sherman Davies; June 24th, 2009 at 11:44 PM. Colossus looks good and I like what you're throwing around as an idea for changes. For Protector, I'm not loving the "the attack affects Colossus" style language. I'd propose something more like "Colossus becomes the target of the attack" or "Colossus rolls defense against the attack and takes any resulting wounds" instead. Yeah, back when I designed him, Normalscape didn't have official wording that referred to "targeting" figures, so I didn't use it. But now that Wave 9 includes units that do so, I'll probably change the wording to something like, "When a friendly figure adjacent to Colossus is targeted for an attack, you may blah blah blah. If you roll a 13 or higher, the attack targets Colossus instead." Also, you didn't bring this up, but the ability is supposed to allow Colossus to protect a buddy from an adjacent attack even if Colossus isn't adjacent to the attacker.